Diggin' The Beach Scene at St. Augustine Beach! Anyone who knows me or knows of me knows that I love the Beach! I am based in St. Augustine, and St. Augustine Beach is a great place to walk, people watch,or just veg out with the sounds of the waves. It's a great walking beach. And, you can even drive on it from the A Street ramp to points south. A1A Beach Blvd. is quite laid back, and although street and lot parking can be a bit difficult at times, you can usually find a spot somewhere. This time around, I didn't have the SUV, and the low-rider sportscar can't go on the beach, but I found parking at the public 10th Street lot (there's a bathroom facility there, which is one of life's most important things). So, I lathered up the Coppertone lotion, enjoyed a relaxing afternoon on my lounge chair, had a little siesta after a long walk on the beach (yeah, you have to walk back too, you know), watched some sea birds, watched some people, and then headed out to A1A Beach Blvd for some cold brew and dinner. 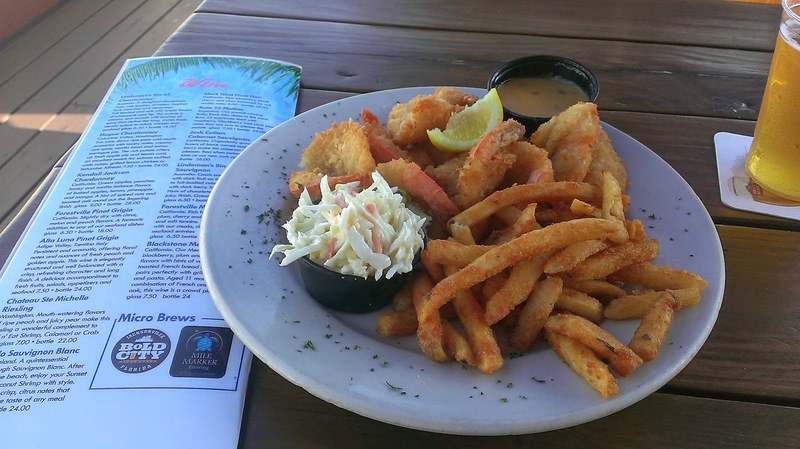 I headed to Sunset Grille, 421 A1A Beach Blvd. This place has fast become one of my favorites. 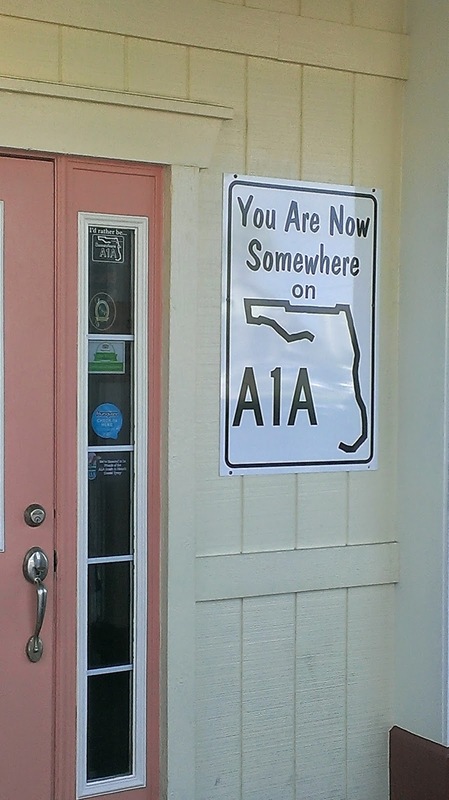 The motto is "Somewhere on A1A," and yes, it's somewhere you want to be. The downstairs area features indoor and outdoor seating and a good-size bar area. Ocean breezes flow through the open windows. I opted for seating upstairs on the roof top. There is a covered seating area, along with tables shaded by umbrellas. I don't mind sitting in the sun (that's what the Coppertone lotion is for), so a little shade and sun combo suited me just fine. There's a great view of A1A Beach Blvd, with the ocean in the background. Yeah, I can get into this! 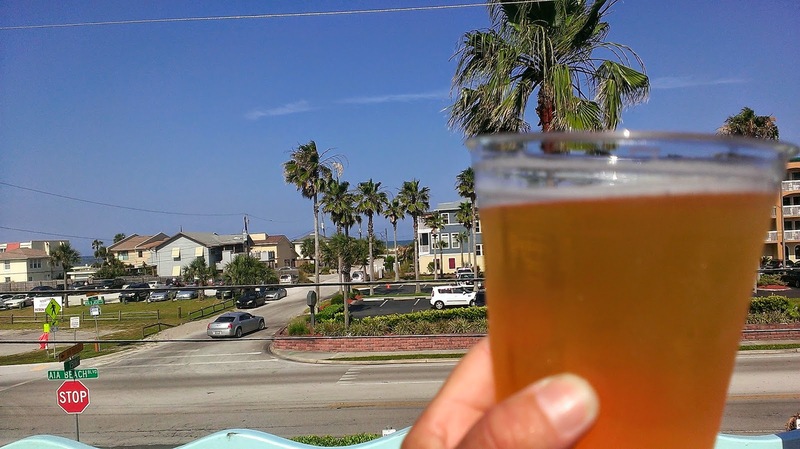 Yeah, that's a photo of a beer with a view. The bar features a full liquor bar, good cocktail offerings, and some pretty good craft brews, including local Intuition I-10 IPA, Mile Marker 82 IPA, and Bold City Brewery beers. There's also the popular SweetWater 420 on tap. By the way, that's a Bold City Brewery Killer Whale Cream Ale in this pic. Great beer for the setting and one of my go-to brews! With all of this research, I had to have a second one as well (it comes with blogging, but we do what we have to do). The place also offers the "usual" beer offerings on draft and in bottle, too, for those novices (sorry) who haven't discovered or delved into craft beer yet. So yeah, you can get Stella, Bud, Yuengling, Landshark, Corona and Miller, too. 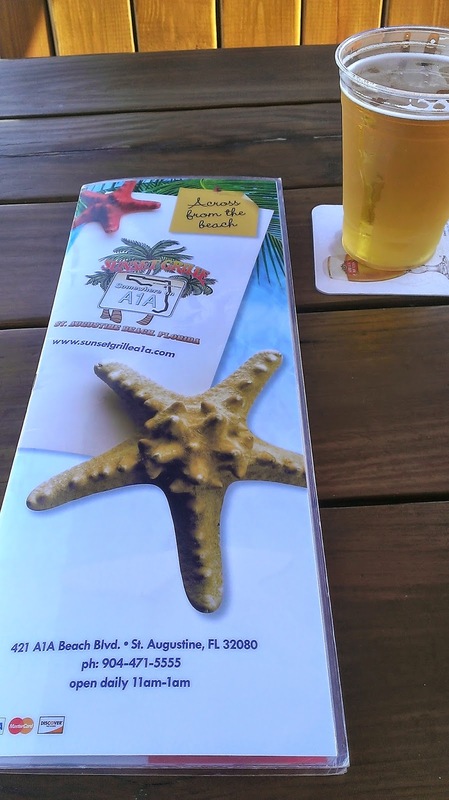 Sunset Grille recently revamped its menu, and I must say, I think it's on point. Nice variety of offerings, such as pastas, steaks, ribs, seafood dinners, large-portion salads, and desserts. I've had the mahi salad (grilled) several times before, and it's a meal in itself. I just love those little tortilla chip strips, and the corn on top is a great addition. This time around, though, I went with the coconut shrimp dinner. The shrimp made my taste buds happy, and the coconut wasn't overpowering, but just right. The Caribbean pina colada dipping sauce was quite good. Ya, mon, a real party. I brought a full dinner back for leftovers, too. That was a macadamia crusted mahi, which was a treat as well. So, hey, BeachBums, do yourself a favor and end up "Somewhere on A1A". You'll be glad you did. And, if you're lucky, you'll see those black-masked parakeets that fly around A1A Beach Blvd (but more on those guys in an upcoming post). Visit Sunset Grille's website, and get social with them on Facebook, Twitter and Instagram (I love getting social with them; they do some pretty cool photos, too). So, til next time. See you out and about in St. Augustine and other places. More St. Augustine Beach and Downtown St. Augustine posts coming - I've been busy lately.